Pivoting from a successful presidential election year to the mid-terms, where the action takes place on the local level, the Republican National Committee was re-evaluating its priorities after the national 2016 win. From December 2016 to February 2017, it looked at which states could be in the winning column and how it would support the various constituencies in each one. Data was being harvested via surveys, consumer data and past data, with digital data like petition signings and emails collections in use, and emails were gathered for free on social media. It now had the ability for its petition-signing efforts to go viral because it could use the president’s website and social media to reach a far bigger audience. After the RNC stopped running TV ads several years ago, all that money went instead to its digital, data and political departments. “There were huge leaps forward in how digital is respected, especially by the political department,” said Hochberg. Now, there was a digital staffer bringing staff meetings up to speed on how Vote.gop was going. That website had been in use since 2014 by the RNC, which was renting it from a vendor. It was functional but provided the bare minimum. By 2017, as the party was gearing up for the mid-terms, the RNC bought the site outright and took it in-house, where the committees can make sure it is legally up to date and develop it over time. In the past year, any extra money went to digital, Hochberg said. Normally, there would be a last-minute TV buy late in any campaign but in the last weeks, money is going to run more ads online and to turn out the vote digitally. The “value of simple” became the creative strategy. 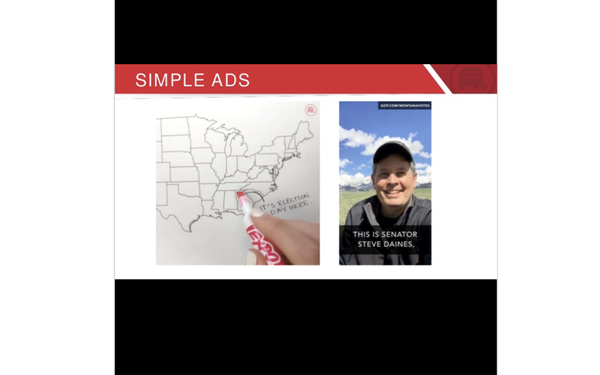 An example would be an ad that outlined the eastern half of the United States with a red marker poised over Georgia and the words “It’s Election Day here.” A Republican Party symbol anchors the top-right corner. Another is a photo of Montana Sen. Steve Daines with the words “This is Senator Steve Daines” beneath and a URL, GOP.COM/MONTANA VOTES, in the upper right. During special elections, the panel was cycling through ads quickly, running them for four or five days to keep the ads useful and allow for interacting with the ads themselves. For the special election in Georgia’s Sixth District, the RNC turned to someone from the creative department to create a film on her cellphone at a conference table. “It took her 25 minutes to do one for Election Day, one for absentee voting and one for early voting,” said Hochberg. “It was the best-performing ad” for that district, which the Republican candidate won. The committee also turned to a senator known for his Snapchat mastery, Steve Daines of Montana. It sent his campaign a bunch of bullet points and Daines sent them back a handful of great ads. In eight states, including Colorado, Florida, Iowa, Michigan, Nevada, North Carolina, Ohio and Pennsylvania, the actual turnout exceeded the expected turnout with as much as an 18% lift. The data was within one-tenth of 1% of expected turnout. Now that the Vote.gop site is up 24/7, the RNC can register voters, start on absentee ballots early and start closing the registration gap. Using email for its low cost, the panel grew its email list and discovered that there were people who donated to the presidential campaign who had not yet registered to vote. And people on its list who signed petitions but still needed to be registered to vote. Use Facebook ads the most for retargeting. Spend more money earlier on digital than other mediums.